Amended 14.5.11. Minor edits 17.2.14. Info, images and clippings added 11.11.16, 14.11.16. Born in the parish of Bishop's Cleeve, near Gloucester. Enlisted at Gloucester on the 15th of April 1846. Age: 17 years 10 months. Josiah Cresswell, 21, Officer's Servant, born Glaston (sic), England. Ann Cresswell, 20, born Longford, Ireland. Next of kin (in 1854): Mrs. Cresswell (wife or mother is not shown [PB: But presumably wife].) Living in Longford, Ireland. "Reduction of the Army and never likely to become efficient - Suffers from the effects of an accident which happened to him in the Crimea in September of 1855. His horse fell with him and so crushed his right foot as to burst the ligaments longitudinally on the inner side of the foot and also the bone of the foot seems to have been injured. He was for some months in hospital before the wound healed and he has never recovered the perfect use of his foot. He was watering his master's horse at the time, he being a batman. The watering place was very dangerous and accidents frequently occurred at it through horses slipping on the stones. I consider that his ability to earn his own living will be considerably impaired." Served 10 years 133 days. Conduct, "very good". In possession of two Good Conduct badges. Aged 28 years on discharge. Granted a pension of 6d. per day "conditional" to the 23rd of March 1865, and this was made "permanent" from the 24th of March 1865. 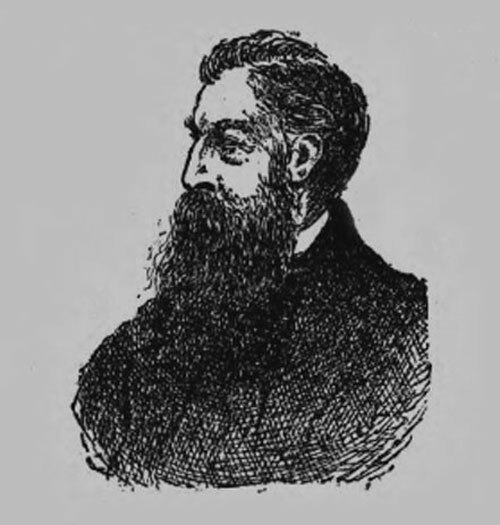 He said he intended to live in Cheltenham, but was living in Sheffield in 1875. There is an entry in red ink on his documents made by the War Office, and dated the 20th of April 1907. 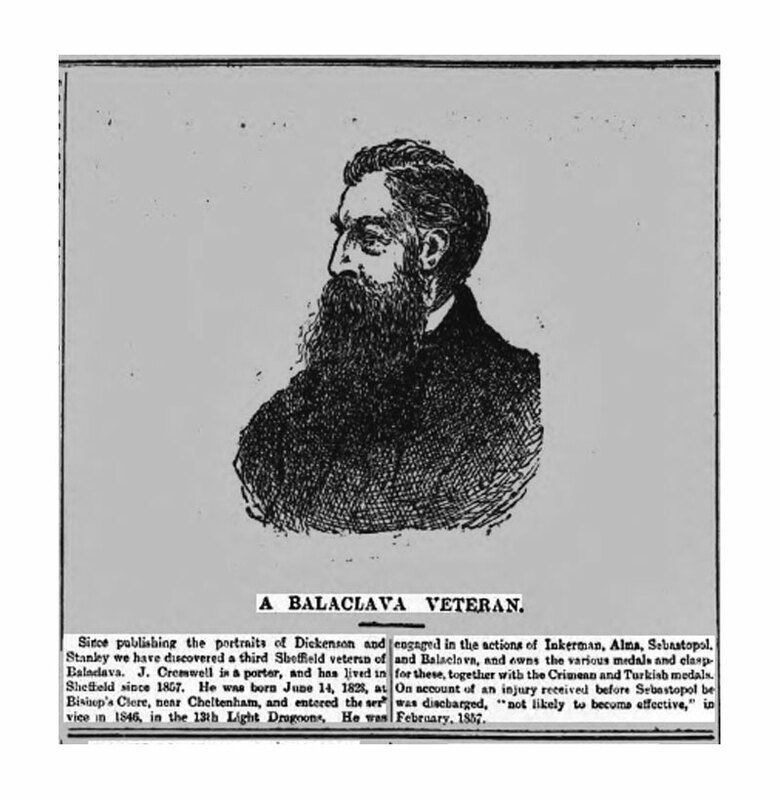 "Awarded Crimean medal with clasps for Alma, Balaclava, Inkerman and Sebastopol." There is also an un-dated entry, "Replacement of medal, son's application," to Sir George White, but no confirmation if this was carried out. 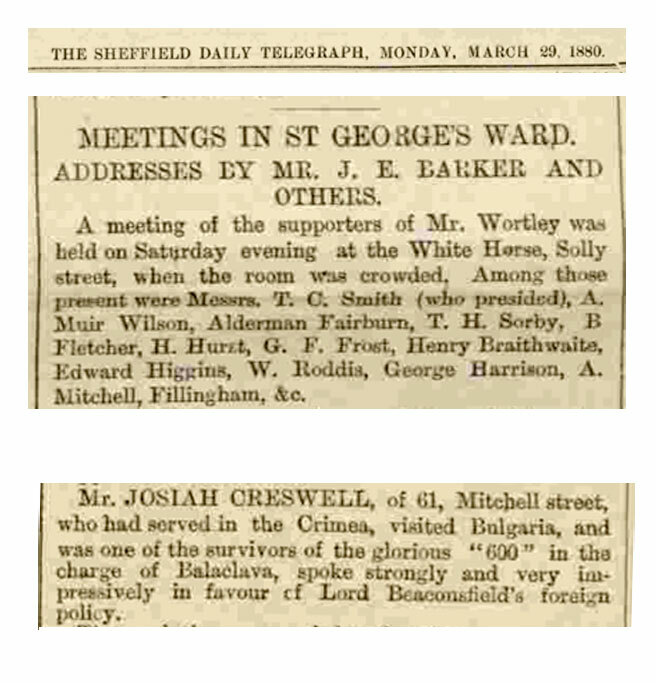 [RM: It appears that Josiah Cresswell married three times. In 1861 he was married to Anne Creswell, born Ireland, but she was dead by the time he married Martha Wrigley at Sheffield (recorded March Quarter 1867). She died aged 55 in Sheffield in June 1880. He then married Ann Betson at Sheffield (December Quarter 1880), and this is his wife shown in the 1881 census. 10/12, Apple Street, in Brightside Brierlow, Yorkshire. 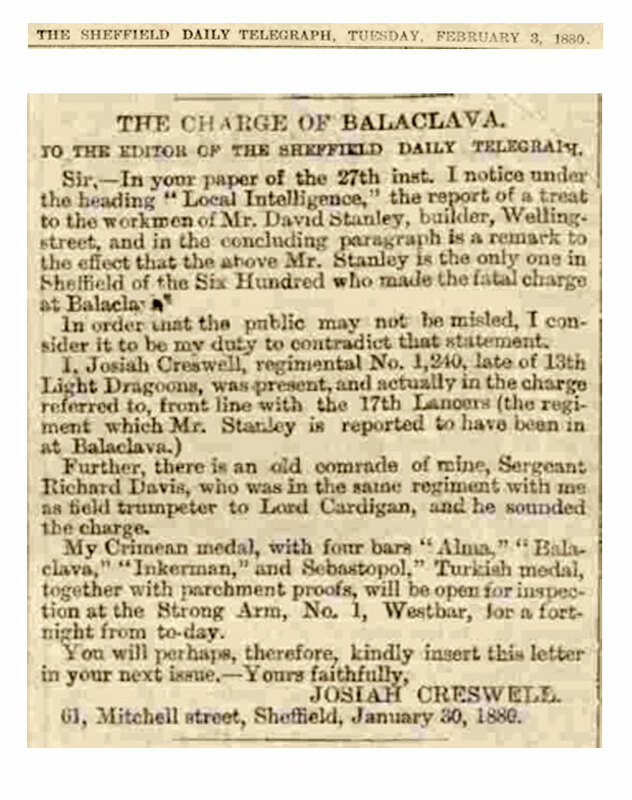 "A third Sheffield veteran of Balaclava": Josiah Cresswell in the Sheffield Weekly Telegraph, 22nd December 1884. Disraeli's second term [from 1874] was dominated by the Eastern Question - the slow decay of the Ottoman Empire and the desire of other European powers, such as Russia, to gain at its expense. Disraeli arranged for the British to purchase a major interest in the Suez Canal Company (in Ottoman-controlled Egypt). In 1878, faced with Russian victories against the Ottomans, he worked at the Congress of Berlin to obtain peace in the Balkans at terms favourable to Britain and unfavourable to Russia, its longstanding enemy. This diplomatic victory over Russia established Disraeli as one of Europe's leading statesmen. World events thereafter moved against the Conservatives. Controversial wars in Afghanistan and South Africa undermined his public support. He angered British farmers by refusing to reinstitute the Corn Laws in response to poor harvests and cheap imported grain. With Gladstone conducting a massive speaking campaign, his Liberals bested Disraeli's Conservatives in the 1880 election." Josiah Cresswell was admitted as an In-Pensioner to Chelsea Royal Hospital on the 1st of February 1888. At the time of his entry into the Chelsea Royal Hospital as an In-Pensioner, he was aged 60 years. According to notes: "his wife would be provided for by her friends", his character was "good", and he had been previously living in the Pontefract (Yorkshire) Pension District. In 1890, while residing at Chelsea Hospita, he claimed £10 from the Light Brigade Relief Fund. Following a visit to the Hospital by a representative of the magazine and in which he described the life led there by the pensioners, interviewed a number of them and took photographs of several... One of the two Light Brigade survivors in the Hospital at the moment is Sgt. Josiah Creswell, late of the 13th Light Dragoons (now 13th Hussars) who was discharged in 1857 [sic]. I could not take a picture of him as he was unable to leave his bed in the infirmary. Granted a "Retiring Allowance" as a Pensioner Sgt. on the 2nd of September 1901. Josiah Cresswell died at Chelsea Royal Hospital on the 19th of September 1909, aged 81 years, and was buried in Brookwood Cemetery on the 22nd of September. No headstone was erected. EJB: The Royal Chelsea Hospital Ground in Brookwood Cemetery covers roughly two acres. "The original Burial Ground at Chelsea Hospital having been closed in 1854, a plot in the Brompton Cemetery was used between 1855 and 1893 when this Cemetery was acquired. 'For though the British soldier has entered many countries as a conqueror, there are few that he has not quitted as a friend.' This monument is erected in their honour by the Lords Commissioners and Governors of the Royal Hospital Chelsea." "The ashes of In-Pensioners are interred here. Their names are in the Book of Remembrance. No individual names are recorded on this and only a relatively few modern stones are in one corner of the plot, as well as a few individual stones to high-ranking officers of the Hospital who are interred on the border strips." Death registration, newspaper clipping with portrait, information about money received from the Light Brigade Relief Fund, and Census information for 1851 kindly provided by Chris Poole.